Addie Lee Barks went to be with the Lord on Monday, April 29, 2013. She was born August 21, 1928 at Glennon, MO to Jeff and Jewell Newcomer Winchester. 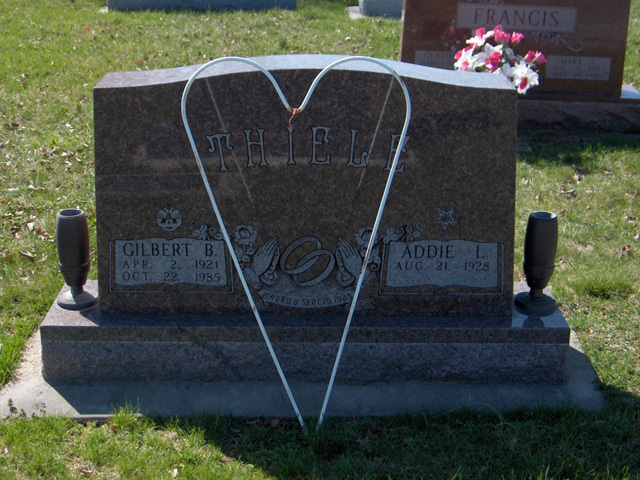 September 19, 1945 she married Gilbert Buel Thiele and he passed away on October 22, 1985. She then married Basil Barks on August 26, 1988 and he passed away on January 6, 1995. Addie was a lifelong member of the Dongola Friendship Baptist Church, a member of the Order of the Eastern Star #174 in Whitewater for 66 years. Most of her life she was a homemaker. Survivors include her daughter Jeffrey (Leo) Adams; brother Ed (Judy) Winchester; three nieces Mrs. Karen Osborne, Mrs. Katherine (Bill) Hartmann, Mrs. LaDonna (Terrance) Juden, five nephews Larry (Dana) Winchester, Mike (Shelia) Winchester, Brad Winchester, Lorin Winchester, Jeff (Heather) Winchester, four step daughters Judy Barks, Joyce (Bob) Korn, Janet (Steven) Harris, Wanda Ramsey, step Niece Susie Robinson. She was preceded in death by her parents, brothers Claudis, Clarence and sister Clarice Jones. Visitation will be Wednesday, May 1, 2013 from 4:00 PM to 8:00 PM at the Liley Funeral Home in Marble Hill. Funeral services will be Thursday, May 2, 2013 at 11:00 AM at the Funeral Home with Rev. Dale Huff and Rev. Randy Poole officiating. Burial will follow in the Bollinger County Memorial Park Cemetery near Marble Hill, MO.